There were some changes to My Repurposed Life in 2014. We got a new blog contributor, Mindi from My Love 2 Create. Mindi has been a friend of MRL for a long time, maybe since the beginning, but certainly before she started blogging. I adore her and I love her style, and I appreciate that you have accepted her and comment on her projects! As I get older, the time seems to fly by faster and faster. I’m not sure if you noticed, but I limit my projects to about one a week (Tuesdays) Sometimes I will share a project on the Fridays that Mindi doesn’t post. I have found that this schedule works very well for me, as my shoulder will probably never heal as long as I keep doing what I’m doing. Let’s get on with a few of my favorite projects in this Year In Review 2014. Headboard projects will always be my favorite repurpose, and this Twin Headboard Bench With Storage, is easily my favorite of last year. Just looking at it makes me want to make another one. I actually ended up donating this one to a charity auction, so I don’t even know where it landed. Speaking of headboards, I don’t always turn them into benches. This Coat Rack from a Repurposed Headboard, was a quick, easy and fun project. This Headboard Chalkboard Coat Rack was wildly popular online, and is one of the most viewed projects of 2014. I believe that dressers are a close second on my list of favorite items to repurpose. This Repurposed Dresser into a Lego Table was not only a favorite of mine, but did quite well on social media as well. This freebie dresser turned into a bench is currently being used as a window seat for my friends’ cats. I have been wanting to repurpose old t.v. cabinets for several years. After getting several cheap or free at a local ReStore, I had fun changing this t.v. cabinet into a kitty litter box hideaway. There is a little mouse hole on the right side for the kitty to go do his business. This post was so popular, I ended up giving this away on the MRL Facebook page. Another t.v. cabinet repurpose used shutter slats to make a herringbone pattern on top of this now useful cabinet. 2014 was the year of fence projects! One of my favorites is this DIY Potting Bench my daughter Jamie and I worked on together. Looking back at this rustic shadow box frame, I wish I had kept it. Mindi shared this fabulous repurposed chair bench. I was inspired by Mindi’s bench to make my own. I’ve always wanted to make a triple chair bench, but have never found 3 matching chairs. I used part of an old rocking chair to make this chair back towel rack shelf. 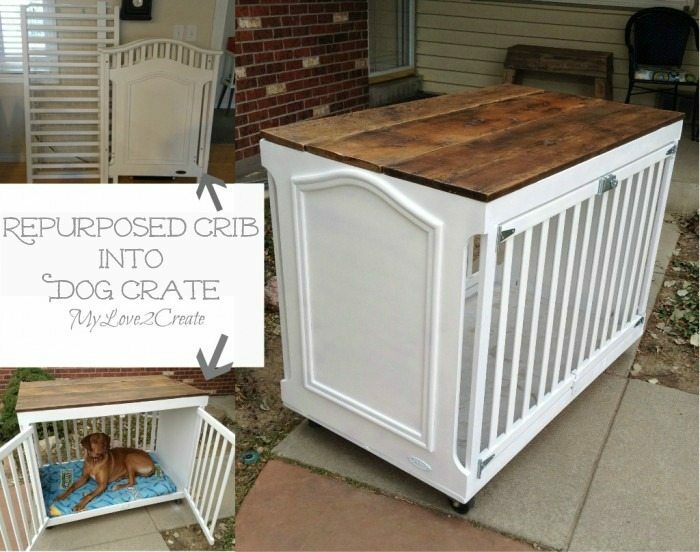 Mindi’s Repurposed Crib Dog Crate might be the most visited link in the last few months. Isn’t it fabulous? The crème de la crème would definitely be my prize winning IKEA Tarva Hack. If you’re new to My Repurposed Life, I sure hope you find something to inspire you to think outside the box. Wishing you all a very happy, prosperous and productive New Year! That concludes a look back at some of my favorites. For a complete look back at 2014, see the thumbnails below. See something you love? click on it and you’ll be taken to the tutorial post. Awww Gail, you are so sweet! Thank you for giving me the chance to contribute on your blog, you are right that I have been following you for a long time and you still are my repurposing hero and my best DIY Teacher! I wouldn’t be where I am without your amazing tutorials! It was so fun to look back on your projects and remember what you did this year! I still love the herringbone table top, and I am still so happy you won the Ikea Hack contest, you are amazing, and totally deserved it! May you have a wonderful year friend! You and Mindi make a great team. I know when I stop by one of you will have created something that lights a spark in my creativity to make something too. I love all these year in review projects—I’ve forgotten about so many cOOl things I’ve seen throughout the year! YOU shared some great stuff, no wonder I always look forward to seeing your post notices in my email! What a great year you had!! Love your projects. Here’s to a fabulous 2015! Happy New Year!